1. 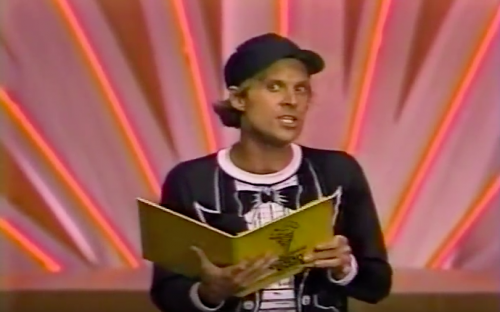 The Yummy Awards – Last week we saw CBS’ 1983 Saturday Morning special, a half hour show with a bizarre premise that seemed incongruent with its goals and that didn’t really make a lot of sense if you applied any sort of thought against the plot. Well, NBC did pretty much the same thing that year, except it was twice as long and much tougher to watch. 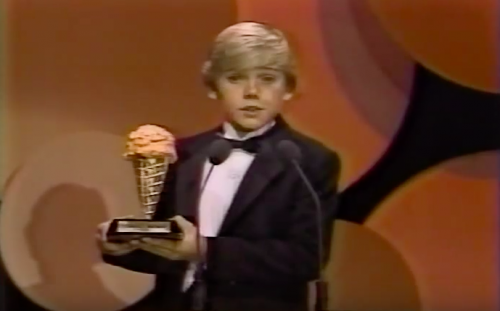 This the First Annual (and Last) Yummy Awards Show, hosted by a young Ricky Schroder and Dwight Schultz, mega-stars of Silver Spoons and The A-Team respectively. 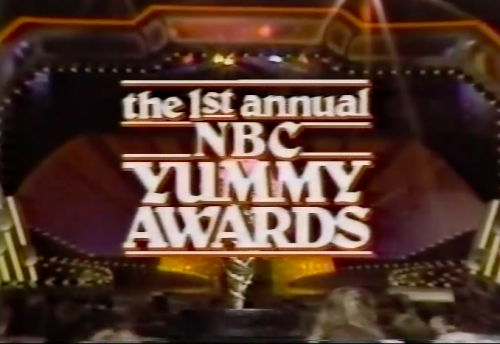 The Yummy Awards is an event attended solely by children and intended to honor Saturday Morning programming with a trophy that contains real ice cream, sometimes a custom flavor depending on the recipient. 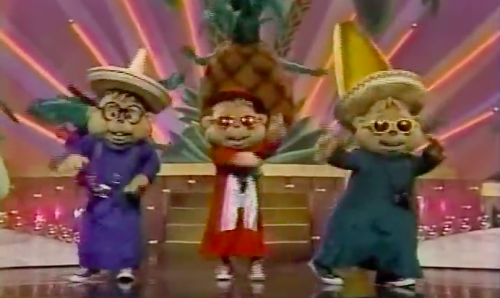 All of this is clearly meant to introduce NBC’s Saturday Morning lineup and maybe I’m not justified in being a little let down by this, but there aren’t even nominees to the categories. 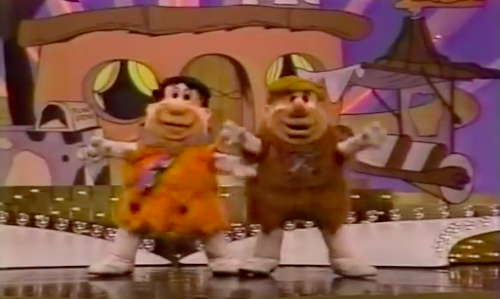 For example, the first category is “The Best Comedy Show Starring Three Singing Animal Brothers”. Who else is it going to be? 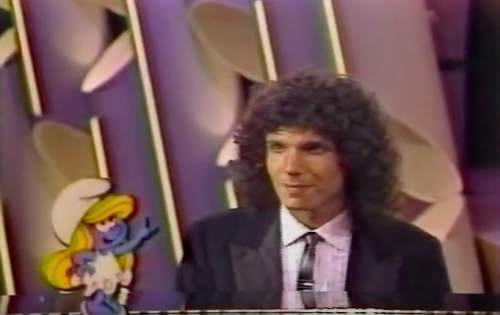 Papa Smurf shows up later to accept the award for The Best Show Starring Little Blue Persons Three Apples Tall from The Facts of Life’s Tootie. 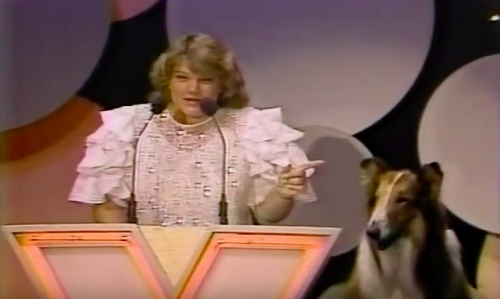 Mindy Cohn also appears to present an award with Lassie. They’re really leveraging the NBC star power in this special. Dwight Schultz is in full Murdock mode throughout, performing hyperactive bits that frequently fail to land. It’s awkward to watch him basically perform to himself, but you can’t say he didn’t try. 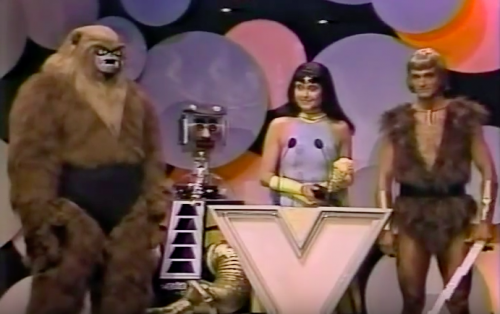 …and seen a live action version of the cast of Thundarr the Barbarian. It’s crazy, the whole thing is clearly phoned in from a scripting and production standpoint but at the same time so much effort went into it. I can’t figure it out. Here’s the whole thing – I stand by my earlier statement that it’s tough to watch, but it’s the good kind of tough to watch. Bonus: the second hour of the video is a full episode of CBS’ Saturday Supercade, for some reason. 2. 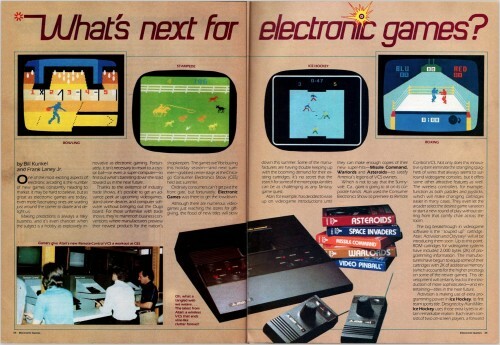 Atari 2700 – Here’s a 1981 article from Electronic Games for the unreleased successor to the Atari 2600, the “Remote Control VCS” or Atari 2700. It featured wireless controls and a few other enhancements, but was basically intended to be a fancier 2600. I love the ‘scoop’ on the new console but I also love the layout of this page! It looks like the 2700 got canned because there was no way to pair the remote controllers to a specific console, so if you were in range of another 2700 your controllers would control each others systems. Whoops! 3. Panasonic VHS Advertisement – In which a robot from the ’80s unintentionally makes us feel a little guilty about our attitude toward electronics. 4. Planet of the Apes VHS ad – And for something to put in that well-performing Panasonic VHS machine, how about all of the Planet of the Apes movies? $19.98’s a steal. I’m being completely serious. Even back then, that’s an great value! 5. 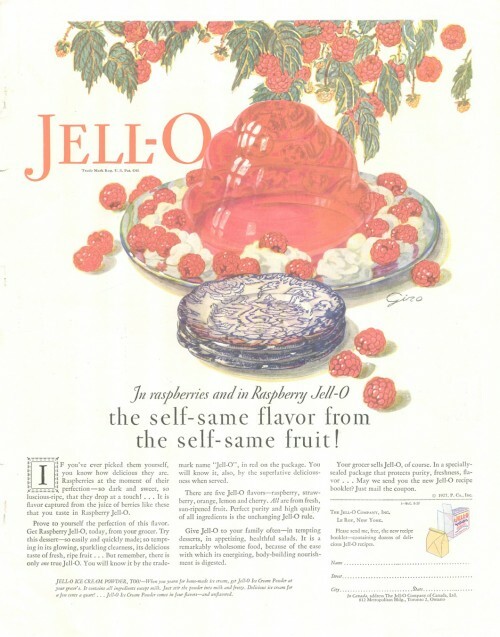 Jell-O – And finally, here’s a gorgeous Jell-O print ad for raspberry Jell-O – arguably one of the worst flavors in existence, but a gorgeous ad nonetheless. 1. Self-same? Really? You’re going to use a stilted phrase like that when your artwork is that lovely? 2. 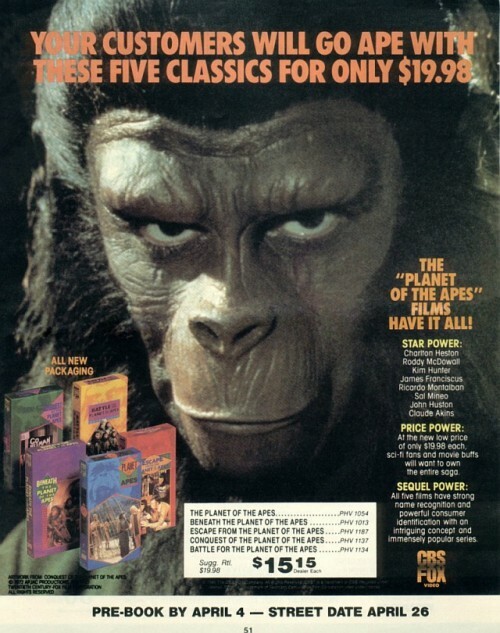 The dealer copy on the Planet of the Apes ad. Are there a bunch of these? What obscure trade publication was this from? 3. 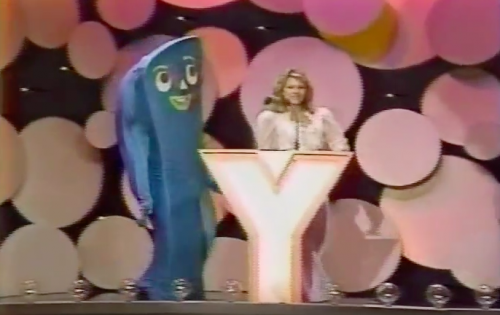 The Yummy Awards: was there maybe some desire to have a sincere awards show for Saturday morning cartoons? Is it possible that the Saturday morning landscape was so competitive that they couldn’t get behind the idea?